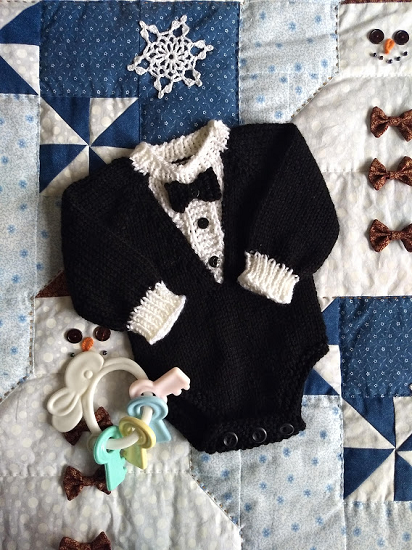 Dress up that little boy for every special event! This little onesie is knitted seamlessly from top down to fit babies from newborn all the way to 18 months. Pattern Only. This 8-page pattern includes instructions for making the onesie in sizes 0-3 (3-6, 6-9, 9-12, 12-18) months. It is knitted with worsted weight yarn and sizes 6 and 8 knitting needles. Skill level - Experienced. Uses short rows and special technique for working the colorwork. Pattern is in PDF format and can be downloaded after purchase.